Early in Thoreau's career, he became obsessed with the problem of getting to be at home in the world. This ambitious book relates that obsession to his way of fostering at-homeness: "inscribing" himself not only through words but through such occupations as the making of books, houses, and tracks in the woods. Frederick Garber reveals that a complex fable endemic in Thoreau and perceptible from his earliest major writings puts inscribing and the quest for at-homeness in terms of a search for a home of homes, a quest that Thoreau realized must be ultimately unsuccessful. 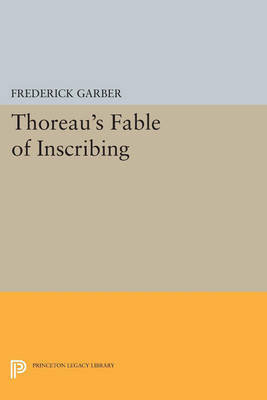 Focusing on Thoreau's major works, particularly on A Week on the Concord and Merrimack Rivers, Garber explores the rich intertextual dialogue arising from this fable and Thoreau's concerns about at-homeness and inscribing. Garber discloses Thoreau's conviction that human lives are radically open-ended, at least in terms of what we can know in the present. All our modes of inscribing are inadequate, even though we can glimpse the possibility of ultimate words and sentences saying all that ever needed to be said. Originally published in 1991. The Princeton Legacy Library uses the latest print-on-demand technology to again make available previously out-of-print books from the distinguished backlist of Princeton University Press. These editions preserve the original texts of these important books while presenting them in durable paperback and hardcover editions. The goal of the Princeton Legacy Library is to vastly increase access to the rich scholarly heritage found in the thousands of books published by Princeton University Press since its founding in 1905.